I cannot recall when it was that I changed my mind about cabbage, but it has been one of my favorites for a long time now. I initially only ate cabbage in the Chinese cold salad form when I was a kid. It’s salted and then marinated in sweet, sour, and spicy seasonings – served with the traditional cold appetizer plate. I ate it up. Did I mention that I am crazy about pickled vegetables? Don’t get me started on kimchi… I could eat that for days on end. Coleslaw scared me at first. In the South, it was usually mixed with a lot of mayonnaise. I’m not afraid of mayonnaise per se, well… yes I am. It grosses me out to consume enormous amounts of mayonnaise. 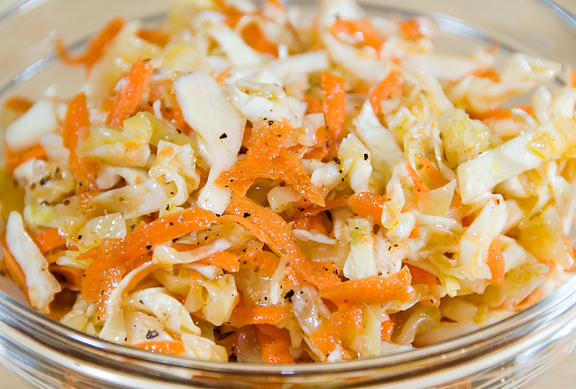 When I moved west to California, I discovered the mayonnaiseless coleslaw and I was hooked, however I didn’t consume much of it because I spent my days eating a lot of fantastic ethnic food that I can’t get my hands on now. So now, in the Rockies, I’ve been driven to making my own favorites because I can’t seem to find them in town. This summer I did a lot of barbecue testing and of course, the natural partner to pulled pork, pork ribs, barbecue chicken, and friends is… coleslaw (among other things like beans, potato salad, and rolls). 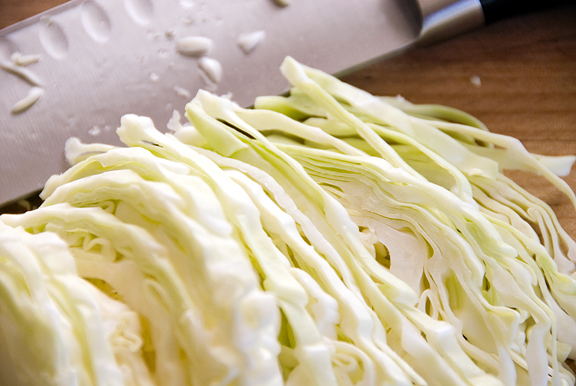 Coleslaw is unbelievably easy to make. Even easier if you omit the mayo. Once, I got a craving for coleslaw while I was at a Safeway in Boulder. I picked up one of their premade packages and tucked in to it shortly after arriving home. First spoonful was odd, the second confirmed my suspicions – it sucked. And from then on out I swore to myself that I wouldn’t waste the $3 again on that junk. From then on out I would make six times the quantity for the same price, but ten times the quality. What appeals to me is the fresh crunch, the sweetness, the tangy vinegar, the bite of the celery seed. It complements any decent barbecue. I especially love it in sandwiches piled on top of Carolina-style pulled pork. Every now and again I will add a spoonful of mayonnaise for a light dressing, but that’s as far as I’ll go on the mayo. Place the cabbage and carrots in a large bowl. 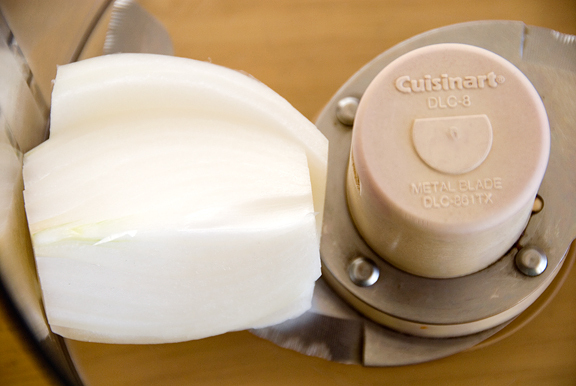 Purée the garlic and onion together; set aside. Heat the cider, sugars, salt, pepper, and celery seed in a small saucepan until the sugars dissolve. Let cool. 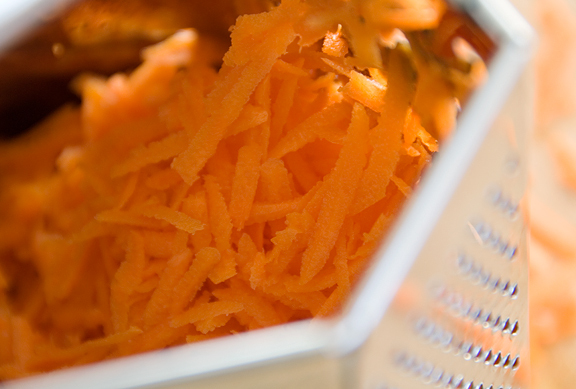 Toss the dressing and purée with the cabbage and carrots. Mix in mayonnaise to your liking at this stage. Serve. 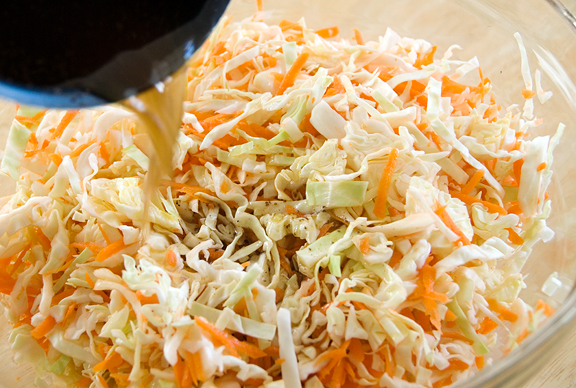 I used to go to a Chinese Buffet that had a similar coleslaw and it was wonderful. I like a celery seed dressing type based cole slow now and then, but I’m a barbecue guy at heart, and creamy cole slaw is where it’s at for me. :) I don’t like too much mayo, either. I’ve also made it with sour cream, which gets past the mayo, but it needs a bit of vinegar then. Yum, that looks great! I’ve always loved cabbage and coleslaws are wonderful with roasted potatoes. P.S: Surprisingly I’ve been craving mayonnaise for a while now…I wonder what that means?! Peabody – in AZ or in WA? Nabeela – mmmm, I love coleslaw with anything spicy or salty! You’re right – mayo slaw abounds down here! However, we often make coleslaw for our fish-fries that has only oil, vinegar, salt, pepper and sugar in it. It’s my favorite kind, and I always ask my mom to make some for me “without mayo” – even though I LOVE mayo in general. I’d just rather it stay away from my cabbage!